﻿ Becky! Internet Mail - RimArts Inc. Since its birth in 1996, we kept improving its functionalities listening to the users' feedback, and it has become one of the most successful shareware e-mail products. It has almost every feature that are needed for e-mail client and has nothing that are only useful for the marketing hype. 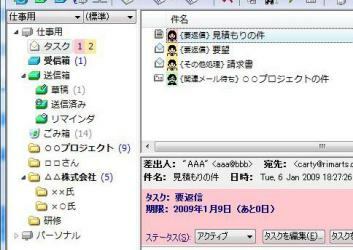 Its no-nonsense usability is widely supported by not only individual users but also large companies and schools, especially in Japan. 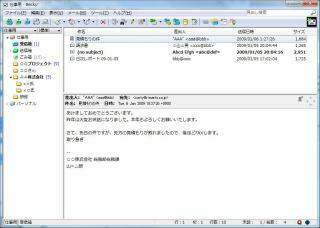 You can view and write HTML mail within Becky! using Microsoft IE's inline component. The useful "Template" feature allows you to create templates for everyday's fixed work, that will incredibly save your time. The friendly "Reminder" feature allows you to deliver messages from you to you on the scheduled date. The powerful filtering manager allows you to create very flexible filtering rule that can contain almost infinite And/Or conditions and various filtering actions. You can also quickly make a filtering rule by drag&drop with Alt key. 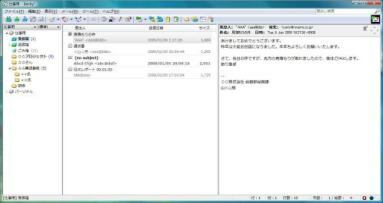 The "Mailing lists Manager" can manage many mailing list that you have subscribed in one window. Its "Plug-in Interface" allows the third parties to create powerful add-on programs. You can bring out your Becky! in your USB memory using "Sync With Portable Media" functionality. You can plug-in your USB memory to any Windows computer and she is there! It leaves virtually no footprint on the target computer, so it is ideal for Internet Cafe. Its "Query" feature searches strings in any folders, and this Query result can be saved as a folder. Its unique "Agents" feature can manage non-urgent work like "Need Reply in Xdays", "Wait for Reply", etc. You can forget about those chores and concentrate on the important work. You can try fully featured Becky! up to 30 days. After the trial period and you still want to use it, you will have to purchase the license. The price is 40US$ and any further update is free of charge. Due to the closedown of Kagi Marketplace(www.kagi.com), now our products are closed to international sales. Software updates will be continued for existing users, and Japanese version is still available for purchase. If you have already purchsed the license and want to update the program, please download the latest version from the following link and install it. There are two versions of archive. Their contents are the same. Just different in the way of installation. * If you downloaded zip file and you are using Windows Vista or newer, open the property of this zip file and "unblock" it BEFORE extracting files. FindMySoft Editor's Review - Very nice review with a short video clip. Beckymail! Yahoo! group - Yahoo! group for Becky! users. Its mailing list is very active. Becky! en français - You can find unofficial French version of Becky! here! B2.bmp - Becky! 's splash image collection. Use your favorite image for Becky! 's startup screen! Becky! auf Deutsch - Die unoffizielle deutsche Version von Becky!